How do I even know I need leak detection if the leaks are hidden? Ah yes, the great paradox. There are two answers to this question. First, we strongly recommend any home or business have leak detection done as a preventive service every few years or so. The plumber may find no leaks. Or they may find small ones, in which case you’ll be glad to have the issue solved early when its small. How do you do leak detection? There’s no one single way to do the job. We use a variety of techniques and tools, starting with visual checks. Depending on the situation, we will then use acoustic listening devices, thermal scanners, video pipe cameras, and other non-invasive tools that won’t disrupt the building. Can I purchase this equipment to do the job myself? No. For one thing, the equipment is expensive, and you need multiple different devices to be able to do a complete job. For another, the equipment isn’t like a point-and-shoot camera. It requires specialized training to be able to handle. It’s quicker, easier, and less expensive to go straight to a professional. How precise is this process? Far more precise than low tech methods some plumbers may use. We can narrow down the location of almost all leaks to the point where little excavation is necessary to reach any leaking pipe. The locating equipment also tells us the best way to go about handling any repairs. Don’t most plumbers offer leak detection? Yes, almost all professional plumbing contractors provide leak detection of some type. (Amateurs may say they do, but please never hire an amateur plumber to do any work for you!) However, not every plumbing contractor has the tools, resources, and training that the team at Sweetwater Plumbing has. Or the accessibility. We serve all of Southern California, and we’re always open for business—24 hours a day, 7 days a week. No matter if you have a small home or a large commercial building, we can handle the advanced leak detection necessary to get the job done right. 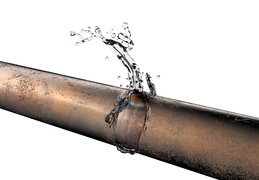 Request leak detection service for your home or business. At Sweetwater Plumbing, we don’t charge by the hour—we charge by the job!